Rust rings from cans really leave their mark on the sink or in the shower—and not in a good way. They’re tough—if not impossible—to remove. Gripponz eliminate rust rings by stopping them from ever forming. 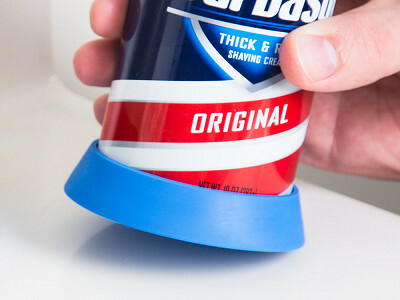 The grippy base fits snugly onto pretty much any can, acting like a coaster that protects surfaces and prevents stains. Think outside of the bathroom, too, and use them on household cleaners, bug spray, or even as a coaster for soda and beer cans. Gripponz are the work of The Gadgit Girlz, Alita Guillen Haytayan and Celeste Nameth. They are geared up to solve the small but annoying everyday problems that bug us all. With simple but effective fixes like Gripponz, they’ve got us excited to see what they solve next. 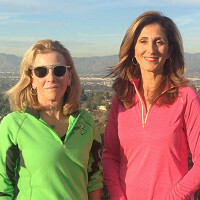 Gadgit Girlz is excited to team up with The Grommet to offer our new product GRIPPONZ. When a can sits on a counter top, you know what happens, that awful rust and gunk ring. GRIPPONZ snaps on to the bottom of your can and stays on to prevent that impossible to remove mess. Any questions? We would love to hear from you! Not only do I hate the rings, but as someone who gets up long before anyone else, trying to be quite, clnk clank clink, then I knock one over, it looks like these would help with all three issues. I will be ordering some of these for sure. Are they a hard plastic, or rubbery or? Hi Jason, right you are, this is a multi-faceted problem solver. Gripponz are made of a fairly sturdy rubber, but definitely not rigid. They have some flexibility to them. the material of Gripponz is soft so also the cans won't chip or crack surfaces. Gripponz also help keep the cans in place so they don't slip around. hope you give them a try, we think you'll be very pleased! @Debbie HI Debbie, This will protect your surface from all sorts of issues. No more mold in your shower. The material we use is Santoprene. It feels soft and flexible. You can hand wash it. Let us know if you have any more questions. @alastair Hi Alastair, As a new product, independent reviews are always a challenge. The good news is we stand behind this product. If you are not satisfied, we want to know. The price is for 2 Gripponz. To keep quality we are Made in the USA. Hi Alastair, as Alita said, you're getting two Gripponz at that price and they're made in the USA. That last one is the kicker. As a Maker, you are rolling serious dice trying to manufacture in the US while keeping products in the wheelhouse of most. So the price gets you two Gripponz and the knowledge that you are supporting American jobs and manufacturing. This is something we hope we will see more of and it's a topic we've discussed on our blog which you can check out here. As far as reviews, if you'd like to wait for the reviews to roll in on site, by all means, do so. If our reviews and testing are reflective of the user experience, which they tend to be, this will be a must-have for anyone who experiences this problem. @Mike I paid $12.00 for ONE item like this from Amazon, to fit on shaving lotion, so this is a good price! We think so, too, Cynthia! I hate those rings, do they fit all cans? I use the Barbasol wide can, will it work? Hello! Yeah, those rings are awful as cleaning doesn't totally get rid of them. I paint the bottom rims with clear nail polish,let it dry, it's good to go and I don't have to wash out plastic lids that I used to use. It's a lot cheaper than five bucks a can bottom!! That's certainly one way of doing it, Elizabeth, and I won't stand in the way of the DIY spirit. But you're still paying for clear nail polish which is typically more than five bucks a can bottom and taking time to apply it for every can. Eventually it will even out. Hi Elizabeth, we found that lasted only so long and gunk still built up around the bottom of the can, making a mess that takes time to clean up. Here's what happens- for $9.99 you get two- all the mess goes into the Gripponz. Every so often rinse it out. Gripponz are long lasting, look good and prevent the cans from sliding around. As we see it, small investment, big up-side! @Alita Ever hear of $ stores i.e. nail polish- 2 coats. How long do you have the same can around? Is it leaking or are you pretty sloppy with the contents? Still have to clean gripponz since your cans are such a mess. Hi Elizabeth, sometimes it depends on the contents of the can and you can never predict if you might knock one over. Luckily, Gripponz only take a quick rinse to clean. I just ordered 3. I like the bottoms on these. I used to paint the bottoms of cans with clear fingernail polish but it wore off before I was finished with the can. Due to remodeling I have multiple kids sharing my bathroom and more cans on the edge of tub than I would have ever dreamed. My question: I have two oval cans that I order from an online company but manufactured in the UK. Do you have any plans to do oval ones? @Linda Thank you for your comments. We found them to be very common and therefor motivating for Gadgit Girlz to come up an attractive and effective solution. Your household with all those cans is perfect for a combination of sizes and colors of Gripponz. We don't have oval shape at this point as most of the US brands are all 70z and 10 oz sizes. We think you and the kids will enjoy snapping Gripponz on shaving cream, hairspray, soda cans, spray cans and cleaners. thanks again Linda for your comments! Have you checked out Rust-O-Less. It has been around a while. It has a 5-star rating, and free shipping. @Eric I'm guessing there are people in our community who prefer a DIY solution that they replenish as needed. Others look for sustainable solutions like Gripponz. But in any case, Amazon has been very predatory towards the kind of companies Grommet discovers so we aren't really looking to promote them here. @Eric Hi Eric, So glad you wrote in. There are different ways of solving problems. Gadgit Girlz solutions are well thought out, effective and attractive. We are proud to say we are Made in the USA, and stand behind quality. It would be nice if you offered a set of one of each size. @Jean Hi Jean, tnx for your thought. A few people have mentioned that and we will certainly consider it. Most people have enough cans around that they have use for a second one of the same size- we will see how often that comes up! I am currently using this product. Love it that I don't have to clean up rust from my shower. I would love to see more colors..especially primary colors. PURPLE is my favorite. Red, Purple, Green, Yellow and Red would be great!! If you could package them in a multi-color pack as well would be terrific. @Karen So glad you are enjoying your Gripponz! Try using your Gripponz on other products around the house as well, cleaning products, hairspray, soda cans. Stay tuned for more colors. . . This sounds like a great idea that I cant wait to try! My only question: once I finish the shaving cream in the can, what do I do with the Griponz? Can it be used for another can? @Jules Yes! You can absolutely reuse your Gripponz. They are washable and reusable. When I was 11 or 12 years old in 1958 or 1959 my father applied for and received a patent for a very thin plastic ring that snapped onto the bottom of shaving cans to prevent rust rings. He had a temporary mold made and samples which he sent to all the aerosol shaving cream makers of that era. They all said that the $0.009 it cost for the rings was too much expense. Too bad he didn't think of it as a product for consumers to buy. Thanks for affirming my dad's good idea. @Howard Thank you so much for sharing that with us Howard. This has clearly been a problem for over 50 years! Your dad's intuition was spot on! I love it! This is so clever and exactly what an every day girl needs. @Jackie You're our kind of girl! No one needs to be wasting time scrubbing when you could be enjoying the fun stuff. Hello! 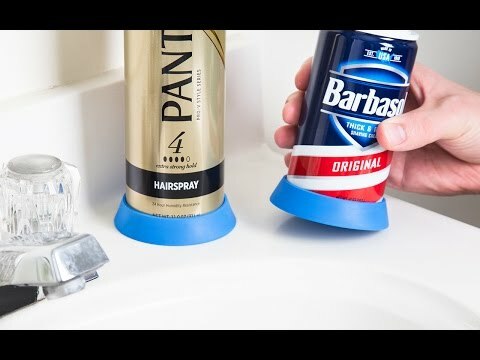 As someone who doesn't use shaving cream, I was at first skeptical as to what use I could find for Gripponz, but I quickly realized my fear was unfounded. There are a ton of bottles and cans around my living space that benefit from Gripponz. Lotion bottles that ooze and mess up my bedside table. Beer cans and sweaty glasses that leave water rings on our living room table. Even crafting supplies like modge podge that can get quite messy. Thank you for the quick and easy life saver! Looking forward to what products you gals come up with next! @Taylor Love it!!! you are one creative, thinking out-of -the box gal! Your product is just what I have been looking for, plus it looks so attractive. Great idea! Wow! Such a simple idea...why didn't I think of it...I needed this years ago! Thanks for coming up with the perfect solution to an age old problem. I cannot wait to see what other great gadgits you come up with. @Stacey K great to hear- this product seems to solve - you are right- a very common problem!! Rust rings from cans really leave their mark on the sink or in the shower—and not in a good way. They’re tough—if not impossible—to remove. Gripponz eliminate rust rings by stopping them from ever forming. 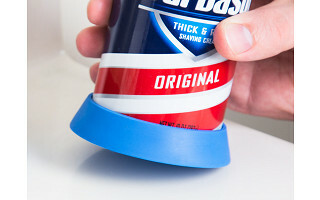 The grippy base fits snugly onto pretty much any can, acting like a coaster that protects surfaces and prevents stains. Think outside of the bathroom, too, and use them on household cleaners, bug spray, or even as a coaster for soda and beer cans.